Historians account 162 thousand Terek Cossacks residing in their Stanitsas by the end of 1894. Their population grew to 255 thousand by the end of 1916. 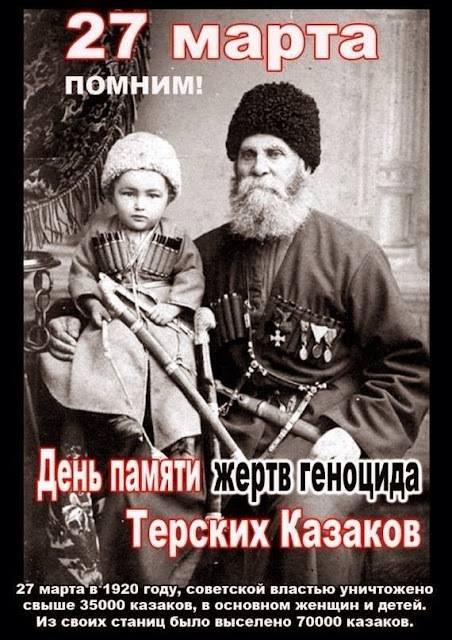 On March 27th, 1920, the first acts of genocide against Terek Cossack became evident. On this day, approximately 70 thousand Terek Cossacks were murdered, and their dismembered bodies buried in a single grave. Among the murdered, were children, women, and old, who were completely defenseless. Their lives forever lost, and beyond recognition, their history seems to be forever lost. Their lands became occupied, and their treasures stolen by the Bolsheviks. The Cossack identity was no longer safe, including those who sided with the enemy. During the 1900s, 70% of the Cossack population was destroyed, yet today we hear stories of the Cossack genocide never occurring. Our People are not given the proper recognition in certain Countries, and the historical importance of this day remains quiet. We can not allow those who laid down their life on this day, go unremembered. Eternal Memory to all Terek Cossacks whose lives were lost during the Cossack Genocide.